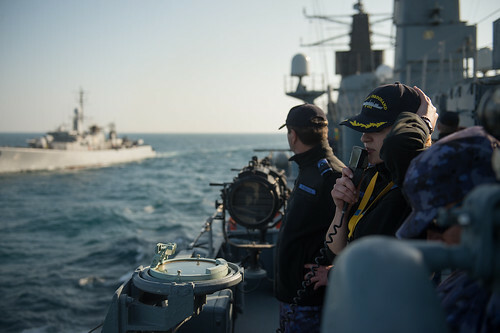 An officer on board the Romanian frigate Regele Ferdinand communicates with a Bulgarian ship during exercise Sea Shield, May 7, 2018, in the Black Sea. NATO participates in SEA SHIELD 18, a national Romanian exercise based on a Crisis Response Operation scenario to conduct and evaluate Anti-Submarine Warfare, maritime traffic control, countering illegal activities at sea, assistance to vessels in distress, defensive anti-air warfare. The exercise takes place in Black Sea from 07 to 13 May 2018.